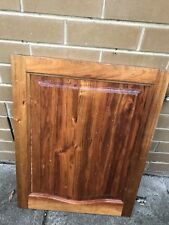 Kitchen Cupboards Solid Timber Doors different Sizes & Drawers Pre-Loved. Condition is Used. Older style in good condition. Gorgeous 1950’s kitchen hutch. The inside hasn’t been touched and is timber. The outside has been restored, but a while back now so ready for your touch if you like. Plate rail in the top cupboards and the top draw is split for cutlery. 1630h x 1200w x 390d. (ONLY the rack, other stuff is NOT INCLUDED). 1 x Rack (unassembled). Color: Silver. Your kindly understanding would be appreciated. Detail Image. Features: Solid and firm quality. Storage layer: 6 layers. The cupboards are solid oak and in excellent condition. This is a huge kitchen. It includes Ilve 800 wall oven, Ilve 900 cooktop, Blanco 900 rangehood. 2 doors - 545 mm W x 710 mm High. 2 doors - 500 W x 710 High. Sizes are 1 door - 497 W x 710 High. If you really want this item then we can discuss exactly how you can acquire it. Weight - super light! ( 1 person lift ). The bottom door has gone forever and only has a small portion left on the hinges. 20X KITCHEN CUPBOARD LEGS. AVERAGE CUPBOARD WILL NEED 4. Ideal for every kitchen, vanity, laundry units. ADJUSTABLE HEIGHT FROM 125MM-170MM aprox. This basket will suit a 800mm wide cabinet. It is supplied with all hardware to install the basket. These are not only suitable for kitchen use, they would be great in a laundry or even in a wardrobe but you must be able to attach the sliders to both sides of you cabinet with an opening of 800mm. Kitchen Cupboard Legs. 100X KITCHEN CUPBOARD LEGS. AVERAGE CUPBOARD WILL NEED 4. Ideal for every kitchen, vanity, laundry units. ADJUSTABLE HEIGHT FROM 125MM-170MM. 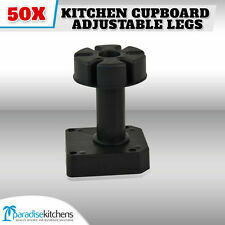 50X KITCHEN CUPBOARD LEGS. AVERAGE CUPBOARD WILL NEED 4. Ideal for every kitchen, vanity, laundry units. ADJUSTABLE HEIGHT FROM 125MM-170MM approx. 100X KITCHEN CUPBOARD LEGS. AVERAGE CUPBOARD WILL NEED 4. Ideal for every kitchen, vanity, laundry units. ADJUSTABLE HEIGHT FROM 125MM-170MM aprox. (ONLY the rack, other stuff is NOT INCLUDED). 1 x Rack (unassembled). Color: Silver. Your kindly understanding would be appreciated. We will try our best to reduce the risk of the custom duties. Model: SAJV-015-41. Weight - super light! ( 1 person lift ). If you went to the trouble of a full restoration then it would look quite good. The general condition is fair to good. If you really want this item then we can discuss exactly how you can acquire it. QUALITY FLOOD TILE & LAMINATE CLEANER 750ML SPRAY BOTTLE. USE ON TILE CUPBOARDS FRIDGE WASHER DISHWASHER. PRE-PAINT CLEANER IS A MUST. MAKE SURE YOUR PAINT STICKS & LASTS. Type: Garbage Bags Stand. Occasion: Kitchen, Daily Life. Features: Easy to hang, Foldable and Convenient. Material: ABS. Due to the light and screen setting difference, the item's color may be slightly different from the pictures. Type: Garbage Bags Stand. Occasion: Kitchen, Daily Life. Features: Easy to hang, Foldable and Convenient. Due to the light and screen setting difference, the item's color may be slightly different from the pictures. Type: Garbage Bags Stand. Features: Easy to hang, Foldable and Convenient. Occasion: Kitchen, Daily Life. Due to the light and screen setting difference, the item's color may be slightly different from the pictures. Practical and functional kitchen cupboards are available in a variety of sizes and designs for all of your essential storage needs. Choose a style that suits your décor and furniture, in a range of configurations that offers the most benefits. Base level kitchen cupboards provide adequate storage for a wide range of essential kitchen items. The kitchen cupboards can easily store larger cookware items like pots and pans that you use on a daily basis. Standard base units typically feature a single shelf. Hiding a dishwasher from sight can help reduce visual clutter. Overhead kitchen cupboards maximise your storage space. The cupboards are designed to complement your base level units and offer additional space for storing plates, glassware, and other items. Choose from plain double door fronted cupboards with multiple shelves inside, glass-fronted cupboards that show off contents, and slim kitchen cupboards that have a single door. Pantry kitchen cupboards are ideal for extending your kitchen storage space into an additional area. You can choose cupboards that match those in your kitchen, or a style variation. If you want to change the look and style of your kitchen without spending too much money, you can opt for replacement kitchen cupboard doors. Fitting your kitchen cabinets with new doors is an easy way to modernise your space. New handles for your kitchen cupboards and drawers can change the look and style of your kitchen at a relatively low cost. Choose from contemporary and modern designs in stainless steel to match the sink, for an up-to-the-minute designer transformation. To organise your kitchen cupboards, add heavy-duty sliding baskets that pull out from the cupboard interior. The chrome metal baskets are available in different styles and sizes and are supplied with ball bearing sliders. Use the baskets for storing a variety of kitchen goods or cleaning products. Foldable tailgate stands that attach to the top of your base level kitchen cupboards provide a convenient and creative solution for hanging up garbage bags.